Icons8 is a collection of 13,800 icons+icon software that saves 7 minutes of work. For each icon! 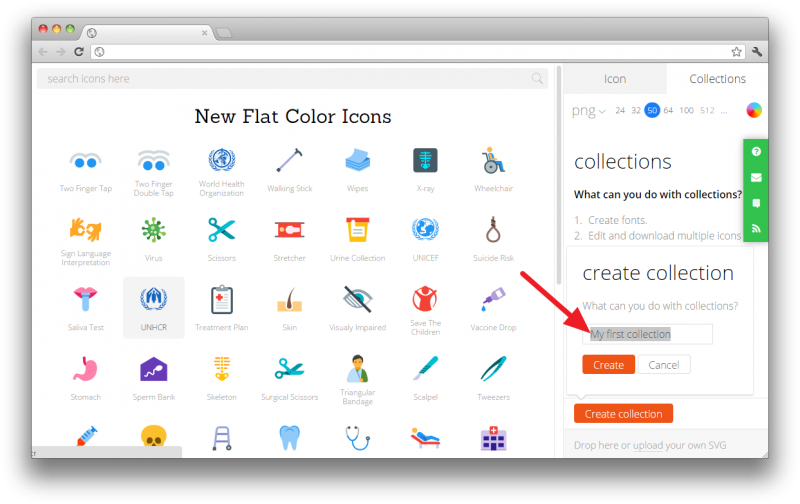 Icons8 started developing flat color icons in March, 2015 (see 300+ icons freebie) and have 1,800 of them now, ready to be shared with Free Web Resources community. All of these 1,800 cuties are yours, but please don’t forget to set a link to Icons8. If you have SVGs (try getting them from 300+ free color icons), you can generate fonts. Although it doesn’t have some of the advanced features of Icomoon (Icomoon is fantastic! ), it’s still pretty good and useful. Also, Icons8 doesn’t limit PNG icons to the predefined icon sizes. Instead, one can generate any icon size within 200×200 px. Given that, you shouldn’t care about the icon sizes yet. However, icons are pixel perfect for the standard sizes for a given icon: 25×25 px, 32×32 px, 50×50 px, 64×64 px and 512×512 px (the latter is for a fee). All in all, it’s about Creative Commons Attribution-NoDerivs 3.0 Unported.